Mix the coconut milk with the curry paste. Add a teaspoon of salt. Cut the tenders the short way so you end up with about 30 nugget-sized pieces. Mix the chicken into the curry mixture. Allow to marinate in the fridge for 1 hour. Meanwhile, mix all the dip ingredients. When the chicken is about ready, get the breadcrumbs onto a flat dish, and bring the frying oil to 350°F. One by one, shake some of the marinade off each piece of chicken and dredge it in the breadcrumbs, pressing to make sure the breading sticks on. After you do about 5, fry them as you start breading the next batch. Fry only about 4-5 minutes until well browned and cooked through. My recent addiction at the local Thai takeout is something they call “crispy chicken panang”. Basically, they make a panang curry loaded with tasty veggies, mix it with some fresh steamed basmati rice, then top it with super crispy fried chicken. I used to get drunken noodles with tofu for a healthy lunch, but the call of the crispy chicken panang is too great for me to resist! I absolutely love the flavors, so I decided it would be fun to recreate the flavor profile of this dish ­ – and pack it inside a chicken nugget! The fun part of this recipe: The creamy curry marinade clings nicely to the chicken and replaces the need for a flour and egg wash. The chicken goes straight from the marinade to the breadcrumbs and into the fryer. 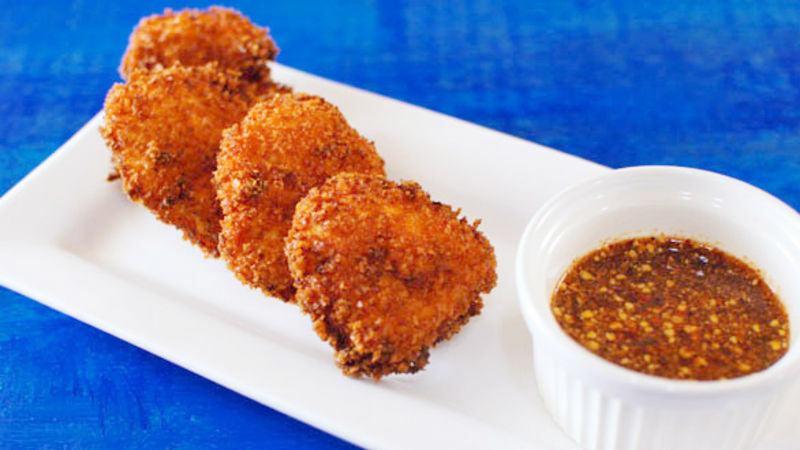 Make these Thai Curry Chicken Nuggets as a fun snack for your next get together, or serve them with some veggies and rice for a complete meal. I usually zip up a homemade red curry in the food processor, but there’s no need for that today, store bought works just fine. The dipping sauce is super easy too. Mix the chicken into the curry mixture, then allow to marinate in the fridge for 1 hour. Instead of bothering with a flour and egg wash, just drip off the excess marinade and go straight for the breadcrumbs. Press the chicken into the breadcrumbs to make sure they stick well. Shake off the excess and get it into the oil. It’s ready when it’s beautifully browned on the outside and fully cooked on the inside. The super crunchy exterior gives way to juicy tender chicken in the middle. And as you can see, there is a tasty layer of that flavorful curry! Dan Whalen gets Thai takeout more than he would like to admit. He has been blogging for over 4 years at The Food in My Beard; check Dan's Tablespoon profile often to try his recipes with creative international spins!